Like global temperature, 'climate jobs' seems to have peaked and are heading downward | Watts Up With That? From the “you too can be a professional climatologist” department comes this very interesting graph. Reader Shawn Fitzpatrick submits this graph after reading our earlier story “Climate burnout is fast approaching“. What it shows is climate science on the downturn, back to 2008 levels. Overall, interest in climate and global warming seems to be trending downward lately, be it from Internet interest or jobs. Hopefully other governments will follow Australia’s example, and realise that in these economically difficult times, with trust in climate science at rock bottom, nobody cares if you fire a climate scientist. Dang. Missed out. They might have to get a real job. “Climate” obviously is not that closely associated with either GW or CC – it is down, but nowhere the bottom like the others. Makes you wonder how our governments can be spending more money on climate change then. Has anyone ever asked the warmist crowd how they plan to maintain a healthy level of CO2 if they shut down all of our carbon emissions? Now, image having a resumé where being a climate scientist is your only job. In these times. Jees, that sounds hard. You got into it to save the world, and now you cannot save yourself. But in all fairness, you pretended to do science and now life is going to pretend it is rewarding you. Hopefully they will not turn to K-12 education. Alarmingly the NRC just released its report today from a Workshop last December in DC on combining the “Next Generation Science Standards and the Common Core for ELA Standards.” ELA is English Language Arts. It is not to be Huck Finn or Shakespeare anymore. It’s not to be science in the traditional sense anymore. But as the Bishop Hill story today reported, it will be a grand narrative. Factual or not. Their predictions are actually coming true. Its the end of the world. No wonder they were all alarmed. They were actually talking about the climate OF change all along. They’re going to lose their jobs. I can’t, for the life of me, see why we would need any more climate research done. Every single possible impact has already been published in 10 different studies. The science has been settled since 1980. The science will not accept any changes to the basic principles. Millions of people have been captured by the end-times philosophy. The models don’t predict any short-term trackable trends, just the ones going out 50 or 100 years. I think we can call it “done” now. 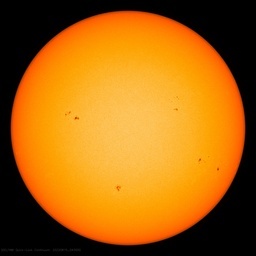 Just move on to see if it is true (and see if the raw temperature records can be resurrected from the dead some day). You do of course realise that when that graph hits rock bottom there will be no more need for WUWT! The well is running dry. European nations are bankrupt, and the US has not had a budget since Obama’s been in office. Continuing Resolutions do just that. Continue spending, they increase it for the baseline, but essentially add no more. on earlier threads (yesterday), i posted the nyt/justin gillis article about the report for Risky Business’s unholy CAGW trio – Hank Paulson, Tom Steyer & Michael Bloomberg. obviously plenty of “climate aka carbon trading” jobs on offer from this lot. the full 202 page (?) report is now available. according to the gillis article, Rhodium “sought to insulate the findings from the political opinions of the sponsors, in part by setting up a committee of leading climate scientists and environmental economists who reviewed the work”! So heyday of “Green Jobs” is past. Now people will need to get a proper job rather than sitting around telling other people what to do! Well, the science is settled, as you know, so we don’t need so many climate scientists anymore. Actually job numbers will increase when global cooling kicks in. Well, interest in “climate” has a nice peak in December, 2009. Those little letters in the chart give headlines in the media that Google apparently thinks inspires the interest surge. F, G, and H refer to articles about Copenhagen and a BBC story. But the real cause is obvious to us deniers – “climate” is the first part of the longer word “climategate”, which broke in late November. Think that might have sparked some interest? Google doesn’t think so. 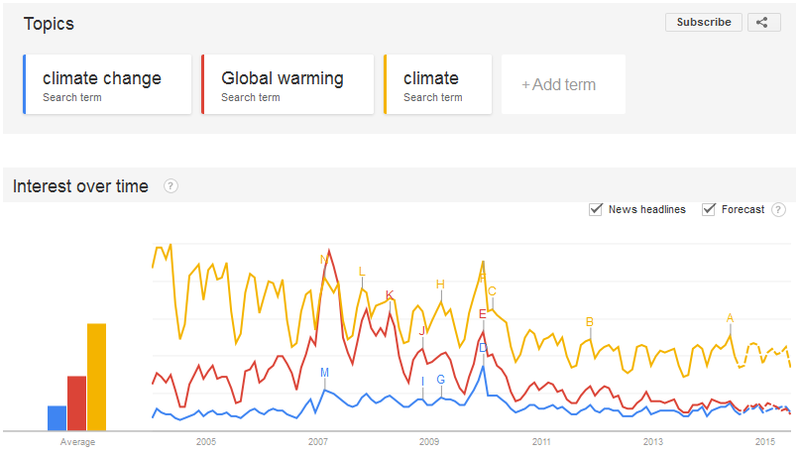 The big spike in “global warming” interest in February-March 2007 baffles me. Any ideas? @EricWorrall, while this is primarily a technical site, we are finding with Obama’s executive actions and a complicit media that facts appear to matter less and less. Anyway, we all know that the alarmists are looking to COP21 in Paris (Dec-2015) as an opportunity to correct for relative failures since Copenhagen (2009). We appear to have Australia, Canada, and India taking a stand at minimum (I may have overlooked some other nations). Would that be enough to block any global carbon agreement? This could merit a review of some kind in terms of the current state of play wrt. COP21 because like it or not that is the elephant in the room right now. Aarrrggg!!! Somebody please run a FFT on that yellow Google trend curve! Looks like an EKG. Not so, Eric, this Australian cares. Climate scientists are people with feelings. Don’t be harsh. If large numbers of employees are fired, that can lead to higher unemployment and that can trash the national economy. Prime Minister Tony Abbott has said, and I agree, that in relation to ‘climate change’, he is not interested in policies that trash the economy. Geoff – this Australian can point you to the carbon tax, mutli billions worth of desal plants sitting idle, the roof batts debacle, wind turbine farms and roof solar panels we all have to subsidise forever.. the list goes on. I don’t cry for them – the damage done by “Climate scientists” is immeasurable. Enough is enough. (2) Carbon tax revenue continues to increase, meaning that administrations are firmly addicted, and like any addict, they are unlikely to listen to reason. My prediction is that climate pseudo-science will attempt to gain underdeveloped third-world country status and claim a right to 0,7% of all carbon taxes collected. By the way, how much has big philanthropy given climate change, from Buffet, Gates, Soros, Zuckerberg, etc.? Not much, but that’s another story. Paucity of contributions in this case possibly does not indicate their lack of belief, rather lack of new market. I’m not totally against this. These people have wives and families to look after. We can’t just leave them out in the street, or worse still, squeeze them into other disciplines. We don’t really want them to go to work in vital areas, such as agriculture, do we? Perversely, I think it’s better they stay where they are, publishing their “work” – they’re much easier to spot that way. when the fired people are eventually hired those would be new jobs. so by firing people you are creating new jobs. the green economy in action. those are old jobs. the green economy promises new jobs. thus it make no sense to leave them where they are. best turf them out so they can get some of those new jobs. as public funding increases, private industry shrinks. the more money governments need, the less left for the rest of us. jobs dry up to be replaced by government employees. eventually non-government business can no longer afford the increasing overhead of government and moves to other countries. border restrictions prevent the people from following the jobs. Any time you want to pay me some of your hard earned, so I can spend more time down the beach, posting comments on blogs, go right ahead. I assure you I’ll do the local economy some good, the beer and food I consume helps keep others employed. The fact that my activities will not benefit you in the slightest shouldn’t be an issue – according to the lefty interpretation of Keynes, it doesn’t matter if you hire people to dig pointless ditches and fill them in, the flow of cash, even from completely pointless activities, still helps keep the wheels turning. There are so few truly “green jobs” little increase in unemployment would occur if they were all dismissed and allowed to seek employment in the “normal jobs” economy. I hear Wal Mart is hiring. Almost all new climate related jobs are an overhead cost to the community and business (excluding Anthony Watts :-),). And this failed experiment is being repeated in so many countries, go figure ? That might explain the increasing levels of vitriol coming from the CAGW camp. As the number of jobs decreases, only the must strident have a chance to stay employed. It’s also good news for the future as the number of people who’s future employment depends on maintaining the myth drops. I’m sure Anthony will have no trouble moving on to the next silly scare story from the Gang that can’t do science. He’s done quite a few stories on things other than Global Warming already. I care. I celebrate every time it happens. As the “Climate” ideology and the “environmental” ideology and “green” ideology all seem to be inextricably linked perhaps a count of “environmental” jobs on offer should have been included as well . I suspect there will be a huge efflux of “Environmental Managers” or “environmental” wannabe’s from some similar basket weaving level environmental courses about to erupt from Australian university courses very shortly. So if you want somebody with degree status to “environmentally” sweep your floors at a very cheap wage as thats all they will be good for, maybe now is the time to advertise. “Only two things are infinite, the universe and human stupidity, and I’m not sure about the former”. They did say CAGW would create more jobs. Remember the rule, do and think the opposite of whatever they claim in Climastrology. 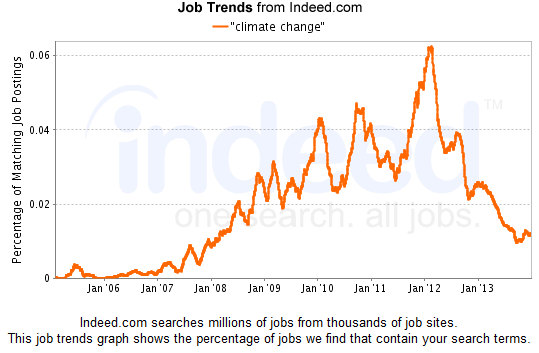 climate jobs’ seems to have peaked and are heading downward…. The problem is that many of these people would not survive in a real job! Eric and Geoff: climate “scientists” are more useful if they dig ditches and fill them in, all by themselves in a remote area. A pointless activity is at least neutral in its social consequences. Sadly, their contribution was negative, because they stopped progress, both in an economic and an ideological sense. The west has gone backwards because of them. Woweee, zoweee! A decline in climate job postings from 0.06% of “total jobs” to 0.01%. What’s not to like? Well, we’re dealing with %ages here: If the number of “total jobs” has increased dramatically, the change in absolute number of climate jobs may not be as great as the 0.06%-to-0.01% percentage change. Anybody know what the “total jobs” numbers are? Maybe we can should start recycling lawyer jokes as climate scientist jokes. Example: Q: What do you call 100 climate scientists at the bottom of the ocean? A: A good start (maybe they got there hunting missing heat).